Coordination behaviour of 3-hydroxypicolinamide (HPA) towards TbIII is studied in aqueous and micellar media. The complex formed exists as ML2 species in which HPA behaves as an O,O,N,N-chelating ligand. The solid complex is isolated from aqueous medium and characterized employing elemental analysis, TG/DTA, magnetic, IR, ESR and mass spectral data. Stability constant and other accompanying thermodynamic parameters of the Tb(III) complex have been determined pHmetrically. The complexation reaction is spontaneous and exothermic. Effect of micelles and pH on the luminescence of Tb(III) were also studied. 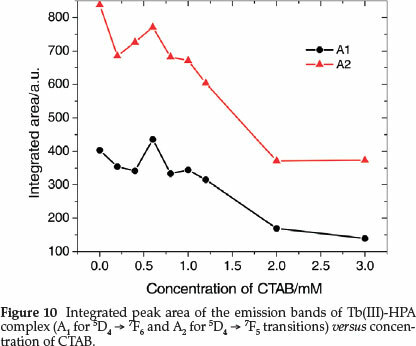 The emission peaks of Tbm are highly sensitized on complexation with HPA and the optimum luminescence efficiency is obtained in slightly acidic to neutral solutions (pH 6-8). The complex decays biexponentially and the presence of ethanol and surfactants causes a large increase in the luminescence intensity protecting the complex from radiationless deactivation processes. Keywords: 3-Hydroxypicolinamide, stability constant, micelles, terbium luminescence, sensitization. Although trivalent lanthanide ions have weak absorption coefficients, highly luminescent lanthanide complexes have been prepared by chelating strongly absorbing organic ligands to the lanthanide ions.33 In such cases, a synergistic effect often referred to as an 'antenna-effect' occurs between the ligand and the lanthanide ion, where the absorbed energy by the ligand is transferred intramolecularly from the ligand triplet state to the lower lying emissive lanthanide excited state. The possibility of having ligands that function as light-harvesting units in lanthanide complexes has been investigated.33 Amongst the ligands that serve as light-absorbing antennas, we are interested in the coordination modes and photoluminescence behaviourof the lanthanide complexes of pyridine carboxylic acids. Dipicolinic acid (DPA) and its derivatives have been shown to greatly enhance TbIII emission upon complexation owing to favourable energy transfer from the ligand's 3pp* excited state to the 5D4 excited state of the metal ion. The energy transfer mechanisms between the lanthanide ions and other pyridine carboxylic acid ligands based on the luminescence of the lanthanide(III) complexes have been reported.34-44 3-Hydroxypicolinamide (HPA, Fig. 1) used in the present work is a potential ligand with different chelating modes45-48 including O,N,O-chelation (as monoprotonated tridentate ligand through deprotonated phenolate oxygen, the pyridine nitrogen and the amido carbonyl oxygen) or O,O-chelation (as monoprotonated bidendate ligand through deprotonated phenolate oxygen and the amido carbonyl oxygen) or O,N-chelation (as protonated species through the amido carbonyl oxygen and the pyridine nitrogen). This compound is fluorescent and generally used49,50 as a model compound for the study of chelating ability and fluorescence of the antibiotic Virginiamycin S (VS). HPA is reported46 to form a highly luminescent Zn(II) complex in which the hydroxy group at the 3-position of the pyridine ring plays a key role in achieving luminescence. We, therefore, aim to study the coordinating behaviour of HPA towards TbIII and the luminescent properties of the complex. We are also interested to investigate the sensitizing effect, if any, of surfactants on terbium luminescence. 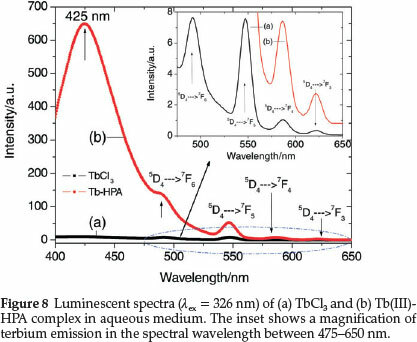 Changes on terbium luminescence as a function of pH is also discussed and reported here. Terbium chloride monohydrate, 3-hydroxypicolinamide, the surfactants (triton-100, Tx-100 and (cetyltrimethylammoniumbromide, CTAB) were purchased from Sigma-Aldrich and used as received. All other chemicals used in this study are of AR grade. C, H and N were microanalysed using a Perkin-Elmer 2400-II elemental analyzer while Tb content was estimated complexometrically.51 Thermal studies were carried out under N2 atmosphere on a Perkin-Elmer STA 6000 simultaneous thermal analyzer in the temperature range 35-850 °C at a heating rate of 10 °C min 1. A Sherwood magnetic susceptibility balance was used for the room temperature magnetic susceptibility measurement using CuSO4.5H2O as standard while IR spectra were recorded on a Shimadzu FTIR-8400S spectrometer in the range 4000-100 cm-1 using KBr pellets. ESR spectra were obtained on a JEOL, JES-FA 200 ESR spectrometer (X-band) using tempol as field marker. Mass spectra were obtained using a Thermo Finigan LCQ Advantage max ion trap mass spectrometer. All the solutions used in the pHmetric studies were prepared only in double-distilled water. 25 mL of three sets of solutions (a), (b) and (c) having the following compositions were prepared by making up the volume with double-distilled water. Solution (b): [Solution (a) + 3.75 mL HPA (3 mM)] and Solution (c): [Solution (b) + 0.15 mL TbCl3 (0.6 mM)]. To each of the solution mixtures to be used for the pH-metric titrations in CTAB micellar media, 1.5 mL of 3 mM CTAB was added before making up the volume. The pHmetric titration of solutions (a), (b) and (c) was carried out with standard 0.05 M KOH solution at 0.1 M KNO3 ionic strength at four different temperatures, 15, 25, 35 and 45 °C. In all the reaction mixtures, 1:3 metal:ligand molar ratio was maintained and all the titrations were carried out at the pH range 3.50-10.50.
where Y is the number of dissociable protons present in the ligand. VLand VAare the volumes of KOH of concentration N (0.05 M) consumed by solutions (b) and (a), respectively, for the same pH reading and (VL - VA) measures the displacement of the ligand curve with respect to the acid curve. V0is the initial volume of the reaction mixture (25 mL), and E0and T°L are the resultant concentrations of nitric acid (0.1 M) and HPA (3 mM) in the reaction mixture, respectively. The protonation curves for the proton-ligand system at 15,25,35 and 45 °C were obtained by plotting nHvs pH. where R (ideal gas constant) = 8.314 J K-1 mol-1; K = dissociation constant of HPA or stability constant of the complex; T = absolute temperature. Aqueous solutionofTbCl3.H2O (0.32gin10mL,1.0mmol)was added to analkaline solutionofHPA(1.01 gin20mL,2.0mmol). The pH of the reaction mixture was adjusted to 7.5 with 0.1 M KOH solution when a light pink precipitate was obtained. The complex was digested on water bath for about 1 hour, suction-filtered and dried in air. Yield: 0.5 g (70 %). IR (V,cm-1): 3300 (H2O), 3197, 1541 (NH2), 1538 (C-O-M), 1648, 1554, 1335 (amide bands), 475 (Tb-N), 410 (Tb-O); (Found: C, 33.10; H, 2.30; N, 12.73; Tb, 36.52 %. Calc. for C12H10N4O4Tb (432.9); C, 33.26; H, 2.31; N, 12.94; Tb, 36.71 %); µeff: 7.90 BM; AM (10-3 M, in DMSO, ῼ-1 cm2mol-1): 7.80.
pH-metric titrations of HPA and Tb(III) complex were performed in aqueous and CTAB micellar media at four different temperatures 15, 25, 35 and 45 °C. The hydroxylpicolinoyl moiety of Virginiamycin S (VS) was shown50 to exist in different protolytic forms at pH range 1.2-12.6 (Scheme 1). At very low pH values (pH < 2), this group was fully protonated while at pH 4.0, the species was present in the zwitterionic form. Increasing pH to about 8.0 would make VS to release one H+ and on further increase to pH 12, VS released another H+ from the amine group forming mono- and di-deprotonated species, respectively. 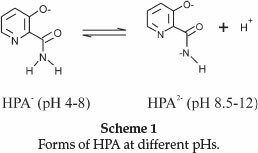 In our study, the titration was carried out in the pH range 3.5-10.50 and therefore we expect to observe only the mono-deprotonated form of HPA at 3.5 < pH < 8.0. 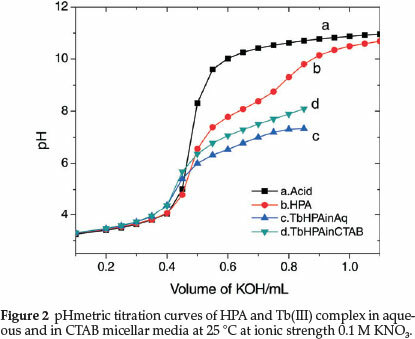 Figure 2 is the representative pHmetric titration curve for Tb(III)-HPA complex in aqueous and CTAB micellar media at 25 °C. 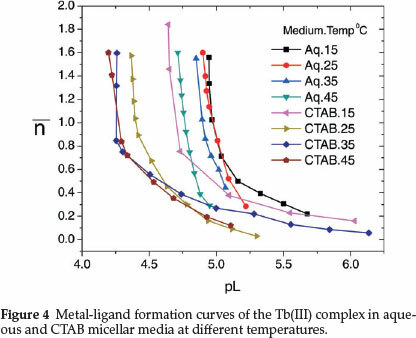 Shift in the buffer region of the ligand to a lower pH upon addition of TbIII to the ligand solution and decrease in pH for the metal titration curves relative to the ligand curve is due to strong metal-ligand interaction. Complex formation competes below pH 8 showing that HPA coordinates to the metal ion only in its uni-negative form. Complex formation curves (Fig. 4) extend to a maximumva n value 1.8. The values of n (0.20 < n < 1.5) indicate that the complexes formed are of 1:1 and 1:2 metal-ligand stoichiometry. Protonation constant of the ligand (log K1HPA) and stepwise formation constants of the complex (log K1Tband log K2Tb) evaluated from the protonation and complex formation curves at half integrals using Bjerrum's method53 at different temperatures in aqueous and CTAB micellar media are collected in Table 1. Thermodynamic parameters associated with protonation and complexation reactions, i.e. changes in free energy (AG), enthalpy (AH) and entropy (AS) calculated using equations (4), (5) and (6) are also included in Table 1. 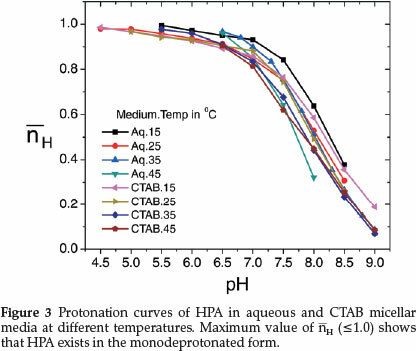 It is observed from the table that protonation and complex formation constants of HPA in presence of CTAB are less than those values determined in aqueous media showing that the reactions are more favoured in aqueous medium. Decrease in the stability constant values of Tb(III)-HPA complex with increase in temperature and negative AG and AH values indicate that the reactions are spontaneous, exothermic and enthalpy-driven in both media. The differences between log K1Tband log K2Tb in Table 1 are all positive and less than unity, which means that the coordination of two ligand molecules to the metal centre occurs almost simultaneously. The complex is non-meltied up to 250 °C and insoluble in water and common organic solvents. Elemental analyses indicate formation of the complex having 1:2 metal:ligand ratio. This corresponds to the pH-metric data. The µeff value of the complex is lower than the expected value for terbium ion with eight unpaired electrons.56 Molar conductance value of the complex at 25 °C in 0.001 M DMSO solution suggests nonelectrolytic behaviour of the complex.57 Weight loss observed in the TG/DTA curve of the complex is compatible with presence of two lattice water molecules. The bonding sites of HPA are assigned based on the comparative analysis of the IR spectra of the ligand shown elsewhere47 with that of Tb(III) complex. Shift in the amide bands in the spectrum of Tb(III) complex suggests the coordination of the amido carbonyl oxygen58 to TbIII. The sharp band observed at 3393 cm-1 in the spectrum of the ligand due to hydroxyl group disappears in the spectrum of the complex with the appearance of a new band at 1538 cm-1 assignable to Vasym(COM). This probably indicates bonding through the phenolate oxygen.59 A broad band around 3300 cm-1 indicates presence of water molecules in the complex. Coordination of ring N60 may be inferred from the negative shift of the pyridine ring breathing and in-plane vibrations at 1077 and 660 cm-1, respectively, in the spectrum of the HPA to 1053 and 630 cm-1 in that of the complex. NH2 stretching and bending modes show significant changes in the spectrum of the complex thereby suggesting possibility of NH2 participation in bonding. However, in any of its transition metal complexes,45-47 NH2 group of HPA was not reported to involve in bonding. Participation of the NH2 group in bonding in the Tb(III) complex may be justified on the ability of the terbium ion to expand its coordination number. 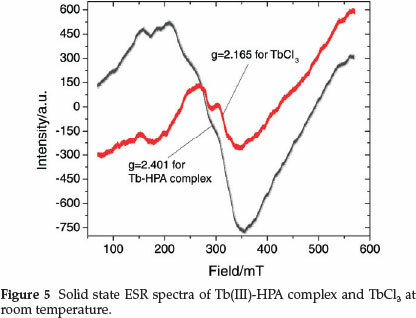 The room temperature ESR spectra of the Tb(III) complex and TbCl3 are given in Fig. 5 and the spectral features reflect rearrangement of the crystal surroundings of Tbm. The spectrum of the complex consists of one intense and asymmetric line with g = 2.401; the asymmetric nature could result from the superposition of more than one resonance line.61 The asymmetry seems to be higher in the Tb(III)-HPA complex as compared to TbCl3 (g = 2.165) perhaps due to the complexation with HPA. In the mass spectrum of the complex (Fig. 6), the base peak at m/z 432 with 100 % intensity corresponds to the composition [Tb(HPA-H)2], which is in agreement with the elemental data and formation of ML2 species observed in the pH-metric studies. However, appearance of other peaks at higher m/z values suggests formation of species with higher M:L ratio in a polymeric fashion, which perhaps explain the observed lowering in the µeff value. Due to the insolubility of the complex, single crystal could not be grown. In absence of a single crystal and after more applicable analysis, a tentative structure for Tb(III) complex showing the bonding sites of HPA and the water molecules satisfying six coordinating sites of TbIII may be proposed as presented in Fig. 7. Coordination of ring-N may occur to other neighboring terbium atom(s). The efficiency of intramolecular energy transfer increases in going from homogeneous solutions to microheterogeneous organized media, such as micellar solutions of surfactants. In many cases, the necessity of a micellar system for the co-luminescent effect was also demonstrated and formation of micelles has apparently a great effect on the increase of the fluorescent intensity in the system.63,64 In order to observe the co-luminescent effect of micelles on the luminescent intensity of TbIII, the spectra are recorded in two different sets of solutions containing two surfactants, nonionic Tx-100 and cationic CTAB in their pre-micellar and post-micellar concentrations. The critical micellar concentrations (CMCs) of Tx-100 and CTAB are 0.24 and 0.92 mM, respectively. Surfactants exist in their monomeric forms in aqueous solutions below their CMCs while they form micelles in aqueous solutions above their CMCs. Comparisons of these spectra have been made with the spectra obtained in aqueous and ethanolic media. 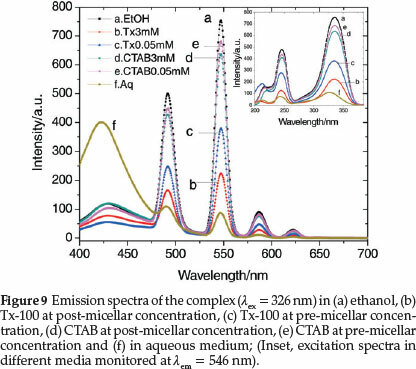 Figure 9 exhibits TbIII emission bands in aqueous, ethanol, Tx-100 and CTAB media monitored at the excitation wavelength 326 nm. Significantly enhanced luminescent bands are observed in ethanol and in presence of surfactants as compared to that in aqueous medium. The fluorescent intensity of Tb(III) is observed to be higher when the concentration of the surfactants are below the respective CMCs of the surfactants and there is a decrease in the intensity of the excitation and emission peaks as the concentration increases above the CMCs. Thus, the effect of the surfactants on the intensity of terbium luminescence is higher in the monomeric forms than in the micellar forms. where A1 and A2 are, respectively, the integrated peak areas of the electric dipole and magnetic dipole transitions of terbium emission bands of Tb(III)-HPA complex. Asymmetric ratio values of the complex in aqueous and in various concentrations of CTAB are collected in Table 2 and the values are found to be less than unity suggesting the occupation of TbIII ions at inversion symmetry site. 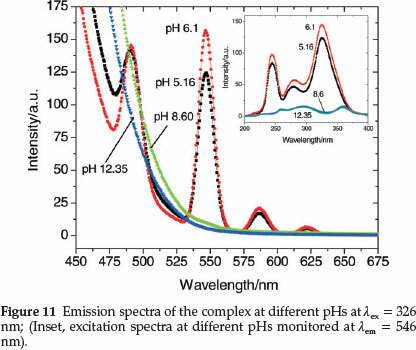 Figure 11 represents the emission spectra of Tb(III) complex at various pHs and shows that pH has a pronounced effect on both the excitation and emission peaks of terbium. HPA enhances TbIII luminescence the most near neutral pH where the maximum intensity is observed at pH 6.1. Thus, the maximum sensitization of the TbIII bands is observed at the physiological pH ranges (6.1-7.5) where the complexation occurs. At this pH, deproto-nation of HPA results which then binds to TbIII expelling the inner-sphere water molecules. This binding brings the chromo-phore closer to the lanthanide ion, resulting in a better sensitization of the 4f-centred luminescence.65 The luminescent intensity decreases sharply as basicity of the medium increases due to the formation of hydroxylated species [Tb(OH)n](3-n)+.66 At high pHs (>8.0), the characteristic terbium emission bands are not observed except for the strong band of HPA at 425 nm. This clearly suggests that HPA exists in the metal-free form above this pH. The luminescent decays of the complex in aqueous and different concentration of CTAB (Fig. 12) were fit very well by biexponential67 indicating that the TbIII ions are not distributed homogeneously in the samples. 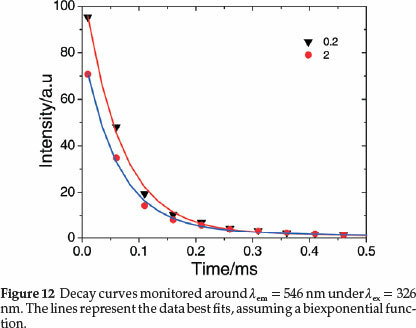 Tb(III) luminescence decay times, t1 and t2 for 5D4 ® 7F6 and 5D4 ® 7F5 transitions, respectively, and the average decay times, tav are also included in Table 2. The lifetime values are less than those for the heavily quenched Tb(III) aquo systems.29,62 Electronic energy transfer among the lanthanide complexes is known to limit the emission intensities of lanthanide activated phosphor systems62 and an efficient transfer of energy among Tb(III) complexes would also certainly perturb the emission lifetimes. A random and little difference in decay times with the concentration of the surfactant is observed from the table, which may be rationalized through consideration of intermolecular energy-transfer properties of the complex in different concentrations of CTAB. It also indicates that the nature of the medium does not exert a significant influence upon the intermolecular energy transfer process and these would only undergo energy-transfer processes through collisional interactions. HPA readily reacts with Tbm in aqueous medium at ~pH 7.5 to form Tb(III) complex having 1:2 metal-ligand stoichiometry in which HPA binds to TbIII in the deprotonated form. ESR spectrum shows asymmetric arrangement around the metal ion. The luminescence of the HPA-bound Tb(III) complex not only retains the narrow-band, long-lifetime character typical of other Tb(III) chelates in both aqueous and surfactant solutions, but also shows a significant sensitization of the bands on complexation with HPA. The intensity of the magnetic dipole transition of the complex is higher than the electric dipole transition indicating occupation of the TbIII ions at inversion symmetry sites and its insensitiveness to the local symmetry. Though the nature of the medium has minimal effect on the shape and position of the emission bands, pH has a significant effect and the optimum luminescent efficiency is obtained at physiological pH 6-8. Since HPA is used as a model for the study of Virginiamycin S, this study may help in exploring other activities of the antibiotic. The authors acknowledge Sophisticated Analytical Instrumentation Facility, CDRI, Lucknow, for mass spectra and C, H, N analysis data. One of the authors (P.P.) thanks University Grants Commission, New Delhi, for a BSR fellowship.